With three checked bags, one extremely heavy carry on and a mandolin on my back, I made it to South Carolina and leg two of my around the country tour before the wedding. It was pretty hard to leave my parents (even though I'll be back up there in a month for Christmas) but I'd gotten so comfortable at home with them. Isn't it weird, and really sweet, how quickly you get used to being back at home. Having dinner with my parents beside me every day, shouting good nights down the hall to them, I felt just like a little kid again and it's always hard to leave that behind. But I am so excited to be staying with my sister for the week and I'm loving every minute of my sweet time with her. I got in late Friday night and we grabbed chick-fil-a and milkshakes on the way home to her apartment. We hauled all my gear up three flights of stairs and settled in for a fun week together. 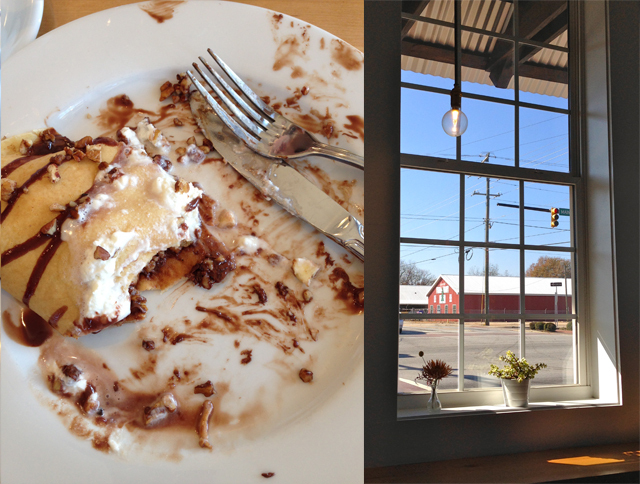 Saturday we slept in and then went on a date to the cutest little creperie called Tandem. I ordered a cappuccino and we both indulged in banana and Nutella crepes. It was a beautiful sunny day and we took our time over a leisurely brunch together. 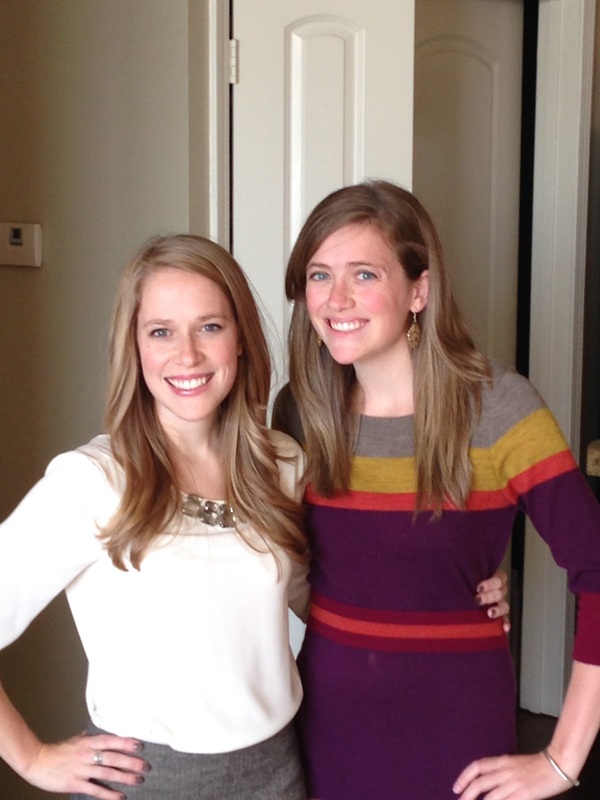 After brunch we got ready and headed to a shower hosted by kind friends of my future mother in law. I have to admit I was pretty nervous as I didn't know anyone going in to it except my MIL and just one of the hosts. I was really grateful that sister was coming with me but, as it turns out, I had nothing to worry about. 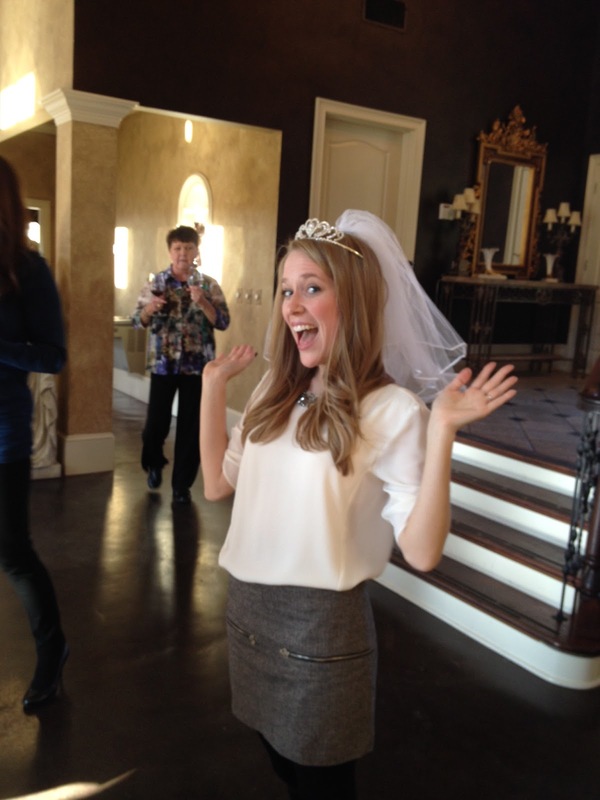 They immediately embraced me, popped a veil and a tiara on my head, and were so excited to hear about our wedding plans and to just get to know me. They were so generous and I am definitely excited that they will be a part of our day. Later that night sister's boyfriend helped us unload all my new gifts and then made us chili and it's been so nice to also get to spend more time with him and get to know him better. On Sunday we went to church (at the church where T.J. and I will be tying the knot in just a few more weeks). I love her church, and even more so now that I'm looking at it through my bride-to-be eyes. I love that it will forever be a special place to me after our big day. And just like I love going to the church where my parents got married in Maryville, Tennessee, I can just picture coming back to town some years down the road and taking future littles there to show them where mom and dad got married. Later in the day I got to join sister at her community group. She has found such a great group of friends from her church to meet with each week. They share food, and their stories, and they pray for one another and laugh with one another- and that's just what I witnessed at one get together. It makes me really eager to get out to Washington and find something like that for T.J. and I to be a part of. A community, friends, a set apart group of people who will be like family while we're far away from family. People who will encourage us in our newlywed years and who will hold us accountable and pray for us and comfort us. Hope everyone had as nice a weekend as we did! My weekend would not even be close to as nice as yours!! I am so happy to hear about all of your pre-wedding experiences! How wonderful that TJ's mom's friends had a shower for you! I am so excited for you, Shannon!! Thanks for sharing all of this with us, here on Blogger!